Billed as “a collaborative exhibition by twenty-four international galleries across eight London spaces” and coordinated by Vanessa Carlos, director of Carlos/Ishikawa, Condo has generated discourse largely centered on the economic straits facing younger commercial galleries in the city. You might be the hottest ticket in town, but cultural capital alone won’t pay your invoices. For this experimental exhibition, various galleries from all corners of London—among them Arcadia Missa, The Sunday Painter, Southard Reid, Project Native Informant, Supplement, and Rodeo—hosted work from galleries from as far afield as Essex Street in New York, Antenna Space in Shanghai, Galeria Jaqueline Martins in São Paulo, and Frutta in Rome. The exchange was a simple one: The hosted galleries sent work to be installed and invigilated by their hosts, in a gesture that will someday, presumably, be reciprocated. Condo is like an art fair without walls, an art fair for the sharing economy. Of the sprawling offerings, a standout presentation came from the newest of the participating galleries, Chewday’s, who showed their artist Nicholas Cheveldave and hosted the Berlin-based gallery Kraupa-Tuskany Zeidler’s artist Daniel Keller. Keller’s sculptural assemblages and Cheveldave’s photo collages, like Condo itself, speak directly to the conditions of art’s production, distribution, and consumption under contemporary capitalism. 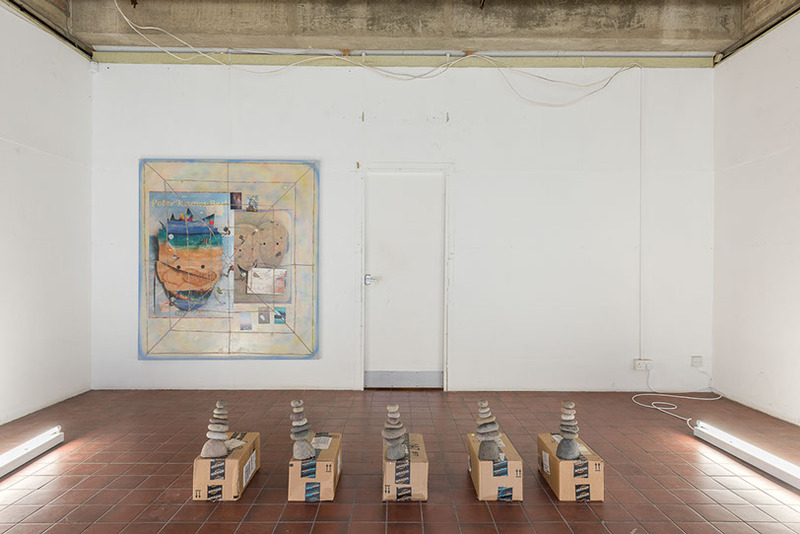 Flanking the gallery’s back wall was Keller’s AmazonGlobalPriority Cairn Unit 2, 2013, comprising seven cairns—stones piled precariously in accordance with size—atop Amazon Prime shipping boxes. These ad hoc plinths were the very boxes in which the prêt-à-porter cairns arrived at the gallery. Instead of balancing the stones as, say, a meditative exercise out in the wild, the staff at Chewday’s needed only to unpack and right the stacks. Hanging on the wall nearby was Keller’s Stack Relief (Kai Zuckerberg + Bushwick Kutcher), 2015, a precise jigsaw of birch plywood, black anodized aluminum, acrylic glass, Hi-Macs quartzTK composite, polyurethaneTK foam, and stainless steel. The compact baroque splendor of the sculpture’s materials by contrast made a series of four works by Cheveldave seem slack: In each, a dream catcher stretches over a laminated collage of personal photographs and altered images appropriated from the Internet. The dream catcher webs (rather heavy-handed metaphors for the Internet) are woven from mass-produced friendship bracelets bought online. These collages address the ways in which even emotions and friendships can be mass-produced, packaged, and commoditized online. Keller’s works, much slicker, promise spirituality without suffering and a peculiar kind of secular alienation. Condo succeeds in mapping the changing geography of London’s gallery ecosystem, galvanizing a sense of community while keeping things informal; but ultimately, it doesn’t stray far from the accelerated and distracted logic of an art fair, where profit motives override curation. It is unclear to what extent the project really supported or nurtured London’s community of contemporary artists. Some of the exhibition’s problems were reflected in the works on view at Chewday’s: Where Cheveldave’s work nods to they ways in which relationships can be deceptively commerce-driven, as one might argue they are in Condo (the show’s exclusions were revealing — where were, for example, Union Pacific or Rowing projects? ), Keller’s mail-order cairns represent an obliteration of context.